Today would have been Dad’s 79th birthday. 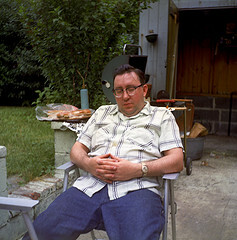 Here’s a nice photo of Dad, having a little nap, probably after eating a couple of burgers off the grill. He looks quite peaceful and content. It’s nearly a year since he passed away, but it really doesn’t seem like it’s been that long. Happy birthday Dad, wherever you are.